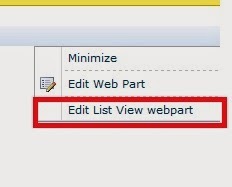 I searched a lot on google try to figure out how we can add custom menu to the webpart with the Keyword "Create Custom Webpart Menu in SharePoint 2010" . but i could not find any result on first two three pages of google Result. finally i found in some page this webpart menu items are called as Webpart Verbs. Once i get this (Verbs) Keyword it was easy for me to get the piece of code from google. I am just writing this if someone like me doesn't know about the Webpart Verbs , for them it might be useful. Add the below code in your Webpart.cs file, it should create a Custom menu as shown in above figure. Hope this article will help to create a custom menu in the webpart. Ask me if you have any doubt.